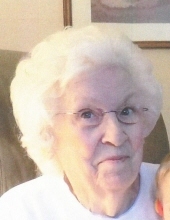 Gladys Virginia Brinegar Compton, 91, of Martinsville, VA went to be with the Lord on Sunday, November 18, 2018. She was born on October 17, 1927 to the late William Alphon Brinegar and Amanda Laxton Brinegar. In addition to her parents, she was preceded in death by her husband, Edward “Edd” Ernest Compton; brothers, George D. Brinegar and Robert A. Brinegar; and a step-brother, Frank L. Taylor. She is survived by her two daughters, Terrie Compton Spencer and husband Doug of Rocky Mount, VA and Kay Compton Vartenisian and husband Richard of Austell, GA; brother, Charles W. Brinegar of Spencer, VA; grandchildren, Tanner E. Spencer and wife Kristin, Kyle W. Spencer and wife Courtney, Bryce A. Vartenisian and wife Britney, and Drew A. Vartenisian and wife Amy. Also surviving are ten great-grandchildren; Taylor Spencer, Reid Spencer, Siena Gallatin, Griffin Gallatin, John Tanner Spencer, Tucker Spencer, Brody Vartenisian, Brynlee Vartenisian, Mia Vartenisian and Levi Vartenisian; and numerous nieces and nephews. Mrs. Compton was a member of Fontaine Baptist Church and had retired from Globman’s as a sales clerk. A Celebration of Life service will be held at 1:00 p.m. on Saturday, November 24, 2018 at Norris Funeral Services, Martinsville Chapel with Pastor Greg Boyles and Pastor Merle Brown officiating. Visitation will be from 12:00 p.m. to 1:00 p.m. one hour prior to the service and other times at her home. Burial will be at Roselawn Burial Park following the Celebration of Life service. In lieu of flowers memorial donations may be made to Wake Forest Baptist Medical Center, PO Box 571021, Winston-Salem, NC 27157-1021 (Reference Cancer Center) in Memory of Edward and Gladys Compton. A special thank you to her Care-giver, Angela Fountain and Sister-in-law, Mary Brinegar and also a special thank you to the staff at Carilion Franklin Memorial Hospital in Rocky Mount as well as the staff with Mountain Valley Hospice for their exceptional care. Norris Funeral Services, Inc. and Crematory of Martinsville, VA is serving the Compton family. To send flowers or a remembrance gift to the family of Gladys Virginia Brinegar Compton, please visit our Tribute Store. "Email Address" would like to share the life celebration of Gladys Virginia Brinegar Compton. Click on the "link" to go to share a favorite memory or leave a condolence message for the family.